What’s the secret to better schools? You won’t find a team of people at The Next Wave that believe educational “drill and fill” is the answer to solving tomorrow’s problems. But, that’s what our schools have been reduced to. In poor urban districts, like Dayton’s, they bought chromebooks for a 1 to 1 initiative, but won’t let the kids take the computers home, won’t teach them to code, and won’t encourage media/content production, the keys to the future economy. We want to see kids engaged in creative personal exploration, but the currently mandated educational standards are all modeled on tested proficiency of a “common core” which leaves little room for creativity. The district is plagued with funding issues, high teacher burnout/turnover and challenged to compete with charter schools. Our Chief Creative Officer sits on the Technology steering committee, and has tried to push for open source tools, providing the infrastructure to bridge the “digital divide” and to make the district differentiate itself from charters. Somehow, the message just isn’t getting through, nor is the district capable of selling its strengths to the community, causing a loop of bad PR, lower housing values, lower property tax revenue, less resources, more bad PR. We crafted a video giving an overview of our turnaround strategy- one that involves rethinking the school year, how we approach the common core, and how to sell our community on a different way to learn. We did this on our own dime. It started a conversation. We’ll see if the discussion moves forward. Anyone in the business of advertising in the decade from 2000 to 2010 should have been keeping a close eye on Crispin Porter + Bogusky, the darlings of the industry. Adweek even made up a new award- Creative Director of the Decade to give to Alex Bogusky at the end of 2009. So when The Next Wave Chief Creative Officer David Esrati had seen Alex introducing B-cycle, a joint venture between CP+B, Trek Bicycles and Humana Health Care, he reached out to Alex and asked what it would take to bring B-cycle to Dayton Ohio. Through one-on-one selling to university presidents, economic development gurus, the director of metroparks, and bringing a prototype of the early bike to the first Miami Valley bike summit, Esrati built the case for bike share. His blog posts built awareness, and his constant lobbying for the program brought the system to town, 6 years after he started talking about it. 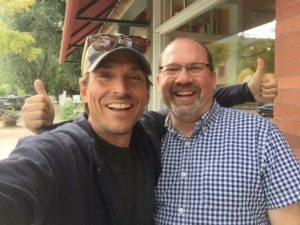 Alex Bogusky left the industry, and Trek is the only remaining partner, but David and Alex stay in touch about other things, looking for opportunities to collaborate. And Dayton’s Link bike share system is being well used, and growing. Ads won’t make your life better. That’s the promise of what ads sell. Political campaigns promise all kinds of things, but rarely deliver, and certainly not before they get elected. 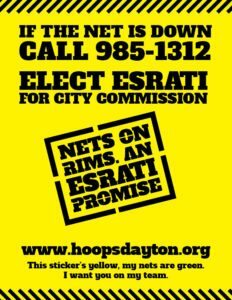 So when our Chief Creative Officer was running for City Commission, he decided that instead of buying $3 political yard signs, he’d buy $2 basketball nets, paint the bottoms green, and go hang them for free, anywhere in the city. The sticker on the pole told the kids who to call when they needed a replacement. Late at night, early in the morning. He’d go clean up courts that hadn’t seen a broom in years, cut weeds out of the cracks, even paint some backboards, hang some new rims. 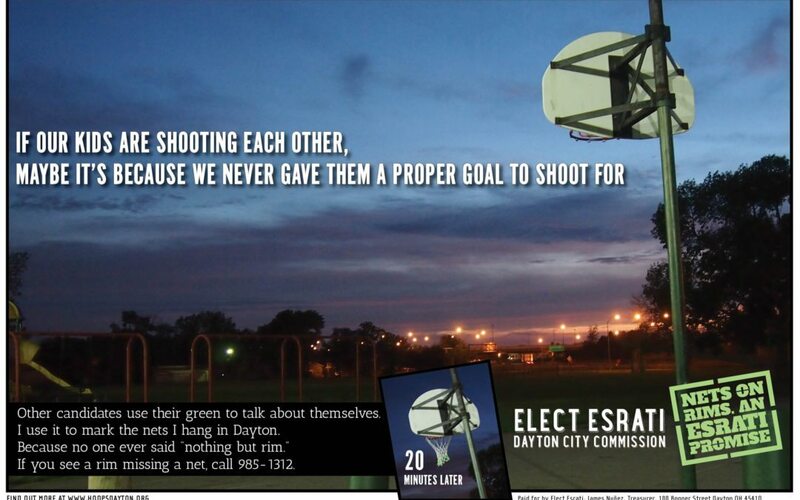 It took time, but, the kids in the community ended up with better places to shoot hoops. To fund the campaign, he went to barber and beauty shops, and sold a poster talking about the abysmal conditions of the city courts for $2 each. The video was made by two high school students who were interning at our office as part of the YouthWorks program. It’s not up to our normal production standards, but it tells the story.